The Jikei Group of Colleges welcomed instructors from Keimyung College University to the campus of Osaka College of Health and Welfare for a faculty training program on July 4. This year’s training program marks the tenth such training program since the Jikei Group concluded a partnership agreement with Keimyung College University in Korea in 2008. The program was arranged and organized by International Center, Headquarters. The group from Keimyung College University consisted of Professor Tae Woon Yoon from the Health Faculty, who acted as group leader, Professor Junho Ha from the Lifestyle Education Faculty, along with nine professors, associate professors, and assistant professors from the Department of Social Welfare and Counseling, Faculty of Practical Music, Faculty of Fashion, Department of Early Childhood Education, Faculty of Hotel, Airline Services, Catering and Tourism, and Faculty of Beauty Coordination. 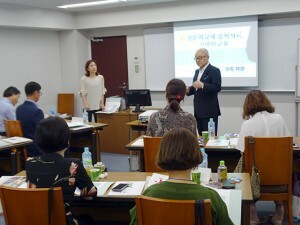 Four faculty members from the Jikei Group of Colleges, including Chairperson Kunihiko Ukifune, who was awarded an honorary doctorate from sister school Keimyung University, gave special lectures on the special characteristics of professional training schools in Japan and the education system in the Jikei Group of Colleges among other topics. Keimyung College University is a 4-year college established by Keimyung University in the suburbs of Daegu City. The college has twenty-one engineering, humanities, and natural sciences-related faculties and departments and approximately 5,500 students. In 2008, the Jikei Group of Colleges entered into an educational partnership agreement with Keimyung College University encompassing collaboration regarding exchange programs for students and faculty members and the creation of teaching materials and curriculums. Chairperson Ukifune was awarded an honorary doctorate of education in January of 2013 by chairperson of Keimyung University. Participants tour Kobe College of Medical Welfare, Sanda Campus, which will host ISPO World Congress next year. The group toured the Sanda Campus of Kobe College of Medical Welfare, an ISPO Category 1 school, when they arrived in Japan on July 3. The school will host the ISPO World Congress (International Society for Prosthetics and Orthotics headquartered in Belgium) next year. On July 4, the faculty members from Keimyung College visited OCA Osaka Design & IT College, Osaka School of Music, and Osaka Broadcasting Arts College in the morning and Osaka College of High Technology in Shin-Osaka and Osaka College of Health and Welfare in the afternoon, learning about the classes conducted at professional training colleges. Chairperson Ukifune gives lecture on professional education to Keimyung College University professors, associate professors, and assistant professors. The classroom lecture was held from three in the afternoon on the thirteenth floor of Osaka College of Health and Welfare. In addition to Chairperson Ukifune’s 1-hour lecture on the professional education delivered by the Jikei Group of Colleges, the group listened to lectures and referred to handouts from Jikei Group faculty members, including a lecture on providing study and living guidance to international students from Yoko Kimura, deputy manager of Jikei COM International Center, which has received 157 students from South Korea; a lecture on career education and student support, which discussed how educators cannot master specialized education without a solid foundation in career education, from Daisuke Ito, Manager of Academic Affairs at OCA Osaka Design & IT College; and a lecture on student job search support, which in the Jikei Group of Colleges emphasizes securing employment in a professional occupation first and foremost, from Shoji Takayama, the representative from Jikei East International Education Center. In his lecture, Chairperson Ukifune spoke about the approximately 1500 international students from thirty-five countries studying at schools in the Jikei Group saying that “graduates from professional training colleges must be able to work together with people from any country around the world” and used a video to introduce international students from various countries who studied at the Jikei Group of Colleges and have developed independence and moved forward. A lively question and answer session was conducted between instructors from both institutions. Later on, Chairperson Ukifune hosted a welcome dinner at a restaurant called Duce Mix Kitchen located in Fukushima Ward in Osaka City for the group. Executive Director Masanobu Takemoto gave the opening address and toasted the growth of the two institutions, and everyone enjoyed a delicious meal while engaging in pleasant small talk. Chairperson Ukifune also presented each of the faculty members from Keimyung College University with a certificate of completion for the training program. The Jikei Group has confirmed the safety of all its students and faculty members following the Osaka Hokubu Earthquake. The group has not received any reports of injuries. Copyright © 2012 THE JIKEI GROUP OF COLLEGES All Rights Reserved.